Tuesday December 11, 2018-Embattled Migori Governor, Okoth Obado, seems to have turned over a new leaf ever since he was released from prison following the cold-blooded murder of his ex-lover, Sharon Otieno, and being in possession of illegal guns. Migori County chief is now a peace ambassador in Nyanza and has vowed to ensure people from the region co-exist in harmony. 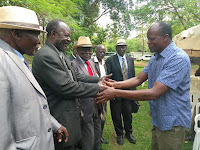 On Sunday, Obado extended his peace campaigns to Homa Bay County when he met Suba Council of Elders at his Migori home. The event was also attended by Luo Council of Elders and the Governor pledged to exploit available ways to achieve unity in Migori. “Thank you and May God bless you all," Obado wrote on Facebook shortly after the peace talks.